The entrance to the lair is the horizontal portal in the middle of Dragon Realms, if it's active you just need to jump on in. The fight can be simple and quick or you can draw it out fighting as it was probably intended. The simple way is to charge after Ripto flaming his ice shield as soon as he stops, he'll rush off to another spot, you run straight to him again and blast him again. Repeat until the shield is gone and you can get a hit in. He'll run off again, hit him another two times to end this. The lengthy way is to sit back and wait for Ripto to fire a couple of ice blasts towards you, walk to the side to avoid. He'll then blast three low ice barriers which you'll need to jump over. Then charge over to him and flame him. It's essentially the first method except with extra waiting and more chance of getting hit. Unless you've got 85% or 100% the fight ends here. You get returned to Dragon Realms with a new ability. Pressing L3 and R3 (or L + R + Up on the D-Pad for GCN) will make Sparx point towards the nearest gem. It's now time to go to Thieves Den though. After you manage that he'll then enlarge himself and put up a Fire Shield. This is exactly the same as with an Ice Shield. Chase after him using your Ice Breath on it until it vanishes and you can get a single hit in to defeat him. If you haven't got 100% it's time for the credits to roll again, they really want you to know who made this thing. Once you're back in Dragon Realms it's off to Jurassic Jungle. With 100% you'll now get to the third and final stage of the fight. It's a bit more tricky than the others. Ripto turns himself into a huge caveman-like version of himself and start his attack. Jump over the rings of ice he blasts out and run away from the single ice blasts (these are usually in threes). After doing two rings of ice he'll occasionally get his sceptre stuck in the ground and you'll hear an electric zapping noise. This is your cue to use your Electric Breath on him. Repeat about six times in total to win, the time inbetween you being allowed to attack varies, sometimes he'll go ages without getting stuck. You'll get a couple of ending scenes and then the credits again. That's everything in the game done and dusted. If you go back into your saved game you'll find yourself in Ripto's Lair again, simply use your Atlas to warp to another level if you want to go explore. Fuuuuuuu! Finally got 90/90 dragonflies after 7+ years playing it on and off and the portal is glitched close. Oh But He Wasn't In Spyro 3. My Mistake. Im Kinda Sick of Ripto Too. 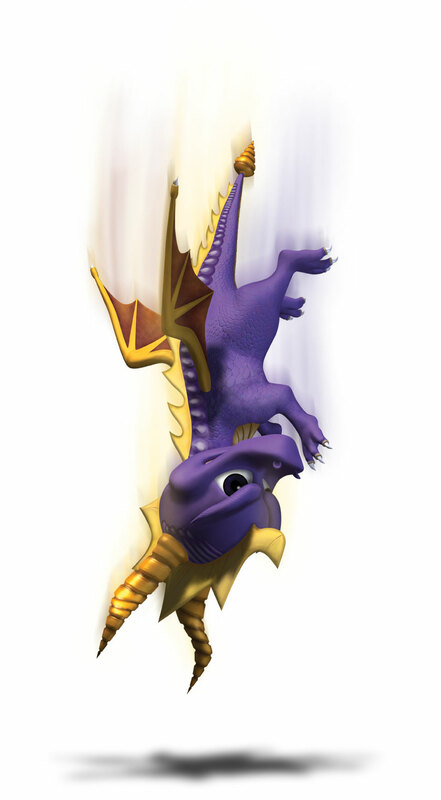 Ever Since Spyro 2, He Was In EVERY Spyro Game Except For Spyro Season of Ice (We Got Grendor Instead). Then After His Final Defeat In Spyro Orange, Its Back To Gnasty And His Gnorcs In Spyro 5... Eventhough Red Was The Antagonist. this game... not the best. FAR to many glitches (though some i used for amusment) and the story was REALLY bad. i'm sick of ripto... anyone else? I think the second thing is just a glitch. I'm experiencing the same things. Try flaming the ice sheild as soon as you get close. This will stop firing at you. I think I might be dealing with a couple glitches in Ripto's Lair but I'm not sure. First, the ice blasts that Ripto shoots in the first round follow Spyro so he can't escape them, even if he jumps or goes to the left or right. Second, when Spyro kills the crickets for health, they don't come back afterwards and, if he gets killed once, when he comes back, the crickets are gone altogether. Are these glitches, or are they things that usually happen to make the fight against Ripto more challenging? Think I discovered glitch in this level. I got to the 3rd round of the fight and Ripto promptly disappeared into thin air! He tried to do another 'HOCUS POCUS' transformation but just vanished instead, leaving me unable to finish him off. Tried a few more times and finally managed to get him but god was it frustrating! Okay. I'm 92% though with the game (on PS2), and I've beat Rypto in the first round. He says, "Noooo, I'm defeated, dragon magic can't last forever anyway, blah, blah," . I'm returned to the Dragon realms, but there is no new power. I continue on to Theive's den and get some more fireflies from the other levels. What now? Do I need to collect all the dragonflies before meeting him again? Right now, I have 77 fireflies. I wish they made a Spyro Trilogy with graphics like the origanal cuz 1) It looks cool :-) and 2) It doesn't take as long for things to load, like in Enter the Dragonfly. Ung! It takes FORE EVUH!!!!!!!! !